I haven’t had any free time to truly express the events that unfolded on May 31, 2013 when my friend Jesse Duncan and I witnessed the El Reno tornado at extremely close range. My flight back to PA left the following day, I didn’t arrive home until very late that night, and the next day I went back to work. With such insane sleep deprivation on top of the fact that I went on this second storm chasing trip putting ‘life on hold’, I’ve had a lot of things to take care of between working and sleeping! Thus, I simply haven’t had the time to really express things in words. And I’m still short on time, so this won’t be an extended post. Looking west-southwest off I-40 a few miles west of El Reno as the tornado had just touched down. Our first view of the tornado was not good to say the least. We had just shot south to I-40 through El Reno and headed a few miles west of town, and stopped at an exit to view the wall cloud to the southwest. You can see in the image above a wall cloud wrapped in rain. There was already a tornado reported on the ground, but we just had too much rain in our view to see it. I decided to re-position to a county road south of I-40 and we ended up with a great view of the multi-vortex tornado to our southwest (seem image below). Multi-vortex tornado looking south from a dirt road just east of a county road feeding south off I-40 south of El Reno. Cutting this post short, I’m going to fast forward to after when got back on I-40 and shot east a few miles (actually 2-3 miles west of exit 130). The tornado had already made the turn to the northeast, expanded and had accelerated to 40 mph! 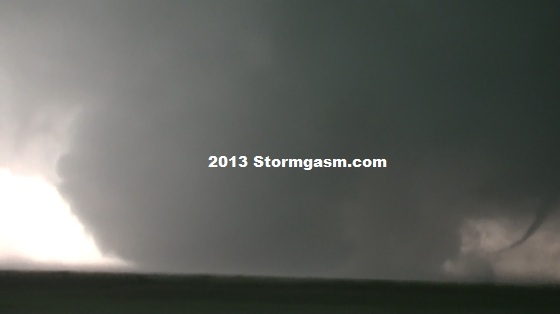 After punching through the rain core, the tornado all of the sudden became visible to our south (seem image below). We continued east another mile or so, now northeast of the tornado. 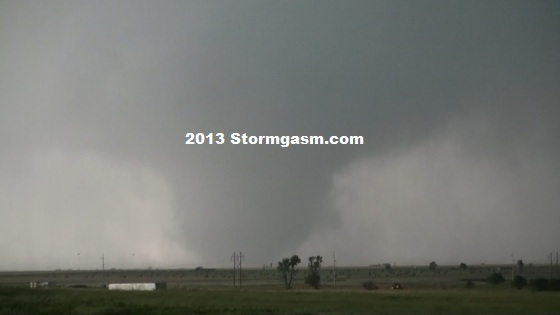 Within a matter of seconds the tornado expanded like nothing I’ve seen before, and became 2.6 miles wide. This is the new record for tornado width in the U.S., and likely makes it the largest tornado in the world. It was rated EF5. Looking south from I-40 just east of El Reno at the tornado that just just emerged from the rain. In the video you can’t even see the entire tornado because the outer circulation actually extended beyond the visible ‘funnel’. Multiple vortices touched down at random well outside of the condensation funnel. The tornado was just so huge, it was very intimidating. I remember as the wedge came within a few hundred yards of the vehicle (just an estimation, I just know it came VERY close to our location) how incredible it was just to be there. I could hear the roar of the tornado out in the field, I could hear the sound of a tremendous waterfall in front of me. The winds around me were increasing dramatically and the air pressure suddenly dropped. The car started shaking. As I looked at this massive, wedge tornado churning in the field just yards away from me and getting much closer by the second, time stood still. I could feel the energy of the tornado effecting everything around me, including my body. It was like I could feel the raw power of the tornado as it got closer and closer to us. I’ve never felt anything quite like this while near a tornado. It was almost as if the energy within me was somehow connecting to the energy of the tornado. I know that sounds strange, but this tornado was SO powerful it was like it was literally grabbing hold of me in this instant in time. This tornado was just something else. 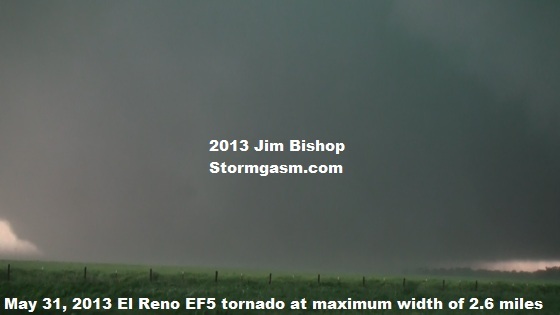 Looking southwest at the El Reno tornado at its maximum width (2.5 miles). This was the largest point during the tornado's life. It began contracting a bit after this moment. Finally, I told Jesse to start driving east to get away from the tornado as it continued to churn closer and closer to our vehicle. Little did we know the traction control for the car was turned on (rental car, had no idea what traction control even was!) and this kept the car from accelerating quickly due to the high winds and rain now pounding the car! 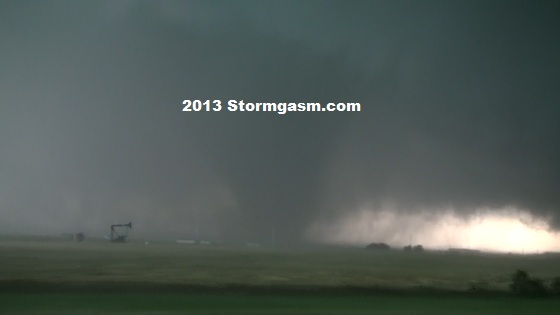 So all of a sudden, we find ourselves in a race to get out of the way of this massive, 2.6 mile wide EF5 tornado. The inflow jet to the tornado was insane with winds easily 60-70 mph blowing directly against (east to west) our vehicle. Random small pieces of debris were flying around us, and driving the car was difficult. Again, this wouldn’t have been a major issue had the car been allowed to accelerate freely(thank you traction control), and we would likely have already driven far enough east – away from the tornado – to where it’s likely none of this would have been a concern. But that wasn’t the issue anymore. 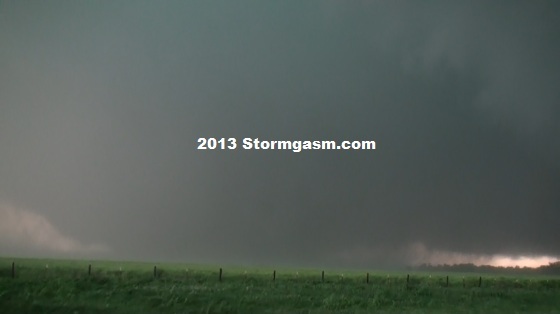 The issue was this massive inflow into that was keeping us within grips of the beast of all tornadoes. At one point the winds shook the car violently and the windshield wipers literally stuck to the windshield! 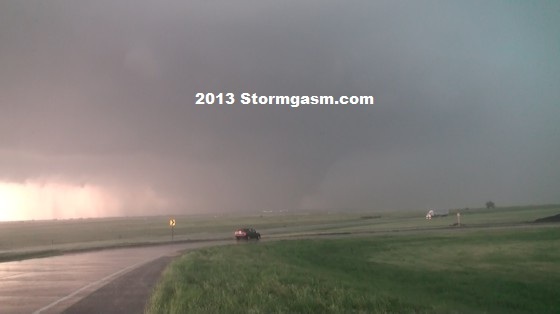 At the same time I saw debris fly up in the air just south of the road (to my right) as a satellite tornado struck it! Pieces of debris flew twenty or thirty feet over the car. The winds were just insane, and you could see the trees were bending nearly to the ground facing west into the tornado! It was like looking at an atom bomb explosion in slow motion. Then suddenly, we were out of the inflow band feeding into the tornado, and we were free! The car accelerated at a great speed, and all was ok again. Things were calm again, it was over. This experience is a good reminder to all chasers that sometimes unexpected circumstances occur, which can sometimes put you and others in risky situations that are temporarily beyond your control. It’s a good lesson and reminder for me as a storm chaser to respect mother nature. She is powerful and once under her grip she’s extremely dangerous. I’m thankful we made it out of there unscathed. I’ve been in a lot of dangerous situations in the past by taking calculated risks, and I’ve always made it out in the end without harm. But this was definitely the closest call I’ve had. It was also the closest I’ve ever been to such a violent tornado, and certainly the most I’ve ever been connected physically to the raw power of a tornado. In reviewing my footage of the El Reno tornado from May 31, 2013, I can across something that really caught my attention. While sitting on I-40 about three or four miles east of El Reno, I was shooting video of the massive 2.6 mile wide EF5 tornado to my southwest. In the video I zoom in on the wedge. A sub-vortex develops on the left. 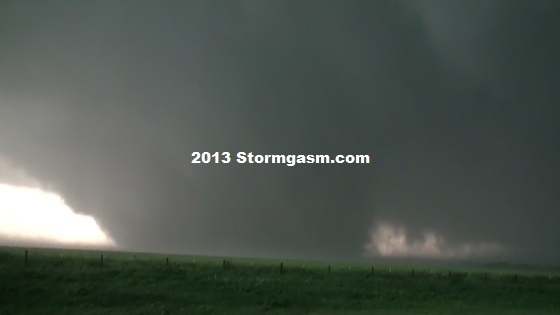 Then, a large piece of debris becomes visible, being thrown by the vortex from left to right at a 45 degree angle downward into the wedge tornado. This piece of debris is very large, though it’s difficult to say just exactly what it is. Whatever it is, it’s being tossed at will by the tornado and you can even see the large piece of debris spinning or rotating, having been forced by the sub-vortex. I haven’t found the time to post a full chase account or to review everything. But I did want to put this slow motion video online. More to come very soon…. It’s difficult to even begin describing the events that unfolded today. It was my final chase day of my second trip out to the plains and I knew the conditions were coming together for at least one large, violent tornado across central Oklahoma. I just didn’t know if I would be able to get into position to see a tornado, though I would do everything in my power to do so. Well I did, and at close range. My friend Jesse decided to come along for this chase and I’m really glad he did. Both for the good company to share the experience with, and also so he could drive! That way I could focus all my attention on the data, navigating and shooting video. I had targeted the area surrounding Kingfisher, but we hung back east a bit just west of Guthrie all afternoon to be just a bit ahead of the storms when they initiated. We ended up driving into Kingfisher anyways once towers went up and then south a bit. At that time there were three supercells all competing with one another. But the southernmost cell suddenly exploded and that’s pretty much when it became obvious this cell – headed towards and just southwest of El Reno – was the cell of the day. Upon reaching El Reno we drove west on I-40 and pulled off at an exit. We could see the meso of the supercell, but the tornado from our vantage point was either wrapped in rain or further to the southwest. So we turned around and headed east and shot south a couple miles on a country road. As soon as we got about 1 mile to the south we could seen a tornado to our southwest by three or four miles. There was actually a lot of ‘traffic’ on this road with chasers and mostly locals kinda blocking the road..especially a couple cops storm spotting. 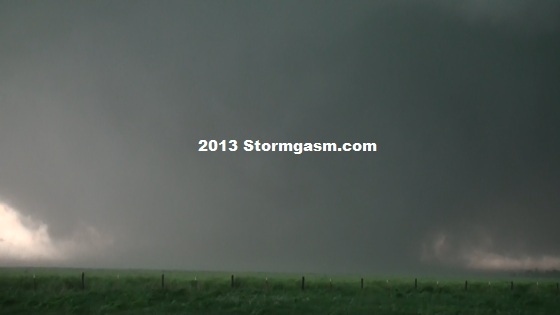 We were able to get around all of them and get into good position northeast of the tornado. After a few minutes we were forced to drive east as heavy rain near the vault approached. We tried going south but the rain bands wrapping around the actual meso to the south around the tornado were massive. So I decided we should head back to the north/south country road and get back to I-40. That proved difficult at first because a chaser actually blocked the road for about 30 seconds with the large, rain wrapped tornado less than 1 mile to our south! Well, we made it to I-40 and the plan was to get east fast and re-position. However, after going three or four miles east the tornado emerged out of the rain to the southwest as a dark stovepipe! 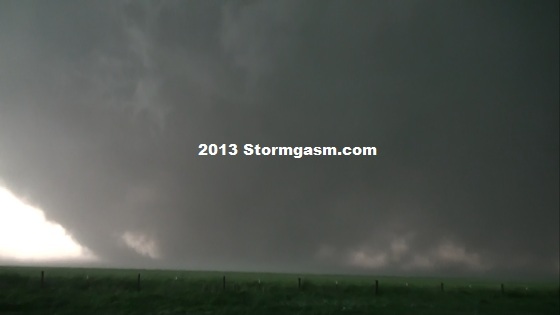 We stopped the car and watched as this tornado became a monster wedge/multi-vortex! The tornado came within an extremely short distance to us before I decided we needed to drive east and get ahead of it. It actually came so close that not only could I hear the roar of the tornado, but I could literally feel the pressure from the tornado. It was almost as if I could feel the power of the tornado right up next me. There really isn’t anything anymore intimidating than that. For a moment time stood still and nothing felt real. Words just can’t describe it.